The title is unfortunate, because I think author Steve Kolowich (who interviewed me for the piece) makes some worthy and astute points that get lost in a broader implication (ie, wikis are over) that strikes me as unfounded. Since I am a relentlessly affirmative person, I’ll start with the stuff in the article I agree with. Wikis have mutated. Wikis have evolved since the days of Ward Cunningham. Jason B. Jones, an associate professor of English at Central Connecticut State University is quoted: “While it’s true that there aren’t a ton of formally wiki-based scholarship projects out there, there are lots of resources that are, if you like, wiki-inspired… Whether it’s the idea of user-generated content, or inviting many eyes onto a project (e.g., CommentPress), or, tools that facilitate collaboration, such as Google Docs or Zoho Office, wiki-like ideas are increasingly important to the scholarly community.” A lot of the activity that might have happened on a wiki a few years ago (like co-authoring a paper with a few people) is obviously better suited to an environment like Google Docs. And if the intent is to invite discussion and annotation on a substantive work, then a more structured format like WriteToReply has obvious advantages. But these developments don’t suggest that wikis are obsolete, but that they have evolved and can take many forms. And CommentPress is just one example of how the better content management systems have developed to support collaborative writing and editing. People have identities. Kolowich points to the disappointing uptake of projects like Scholarpedia and AcaWiki as evidence of the failure of wikis to take hold in higher education. In fact, if I read the article correctly the failure of these projects to take off is the only evidence presented that wikis as a technology are in decline. (And even on this point, the article acknowledges that some discipline-specific or community consultation wikis seem to be quite successful.) Does the lack of activity on these cherry-picked “broadly imagined academic wiki projects” reflect on the technology itself, or on a misguided impulse to create centralized, homogenized spaces for inquiry? The article notes the need for individual contributors to receive attribution, which is a fair point, but I think the problem goes deeper than that. The web should be a place that can facilitate a wild diversity of perspectives and voices — that’s what makes it such a cool place. Creating some sort of superstructure and expecting people to willingly subsume themselves to its logic makes no sense outside of certain specialized applications (like creating an encyclopedia, for example). This highlights a niggling dissatisfaction of mine about some OER discourse, which seems to envision resource creation processes so standardized that distinct and idiosyncratic voices are put at risk. But broadly writing off wiki technology based on these observations oversteps the argument. There is obvious value to wikis as part of an online toolkit, especially for the creation of open content. I think WikiEducator has been a success, I certainly admire its role in the open education community. I’ve been part of a few collaborations hosted by the New Media Consortium (the Spanish language Horizon Report, the Open EdTech group) where the wiki played a useful role in facilitating on-site and virtual collaboration working toward the creation of a formal paper. There’s the NMC’s original Horizon Report itself, of course. And let’s not forget the imaginative and valuable work that can be done on wikis housed outside formal academia, like Wikipedia. Closer to home, wikis are a bigger deal at UBC than ever. We have the newly launched UBC wiki, which people can use for everything from one-off pages to extensive ongoing research for specialized topics or courses. The wiki is also integral as the content engine for our emerging online publishing framework. For instance, our unit has developed a WordPress plugin that allows MediaWiki content to be rendered live within any WordPress environment. (You can get the plugin here.) For example, this faculty resource guide can be rendered in WordPress here. It can simultaneously be syndicated anywhere else (such as a partner organization), with the content adopting the look and feel of the local site. We also provide YouTube-style embed code in the “toolbox” on the left-hand sidebar of our MediaWiki pages so people can grab syndicated, dynamic open content themselves and put it in any web environment, including an LMS (wiki version here). Why do this? Well, imagine a widely used piece of content like a basic WordPress how-to tutorial. This open content tutorial might be re-rendered in more than a dozen places, many of which we may not know about. If the content is updated once on the wiki, that update is automatically rendered on all the downstream environments. So using the wiki as the foundational environment for our content creation allows for easy collaborative writing, and maximum flexibility and reusability. We see big potential here… for open content in courses, for our internal (but shared) documentation, and much more. Other units here are beginning to use this framework for much of their own online publishing (I’ll share these examples as they develop, some of them look great). We have even hired a graduate student in library studies to be our “wiki gardener”, to gently guide activity and to help put structures in place to provide a semblance of order without losing the flexibility that makes wikis great. Check out Will’s fantastic blog on his process and thinking, it’s an incredible evolving resource in itself. If wikis are dead, it’s a freakin’ zombie-fest over here. We’ve recently moved our 6+yr wiki platform (thinkubator) to WordPress because there’s so much more development momentum (largely thanks to your and your friends, Brian). But conceptually, I don’t think we’ve actually moved very far away; it’s just WordPress pages instead of wiki pages… it’s still collaborative, and editorial, and designed bottom-up. So perhaps the wiki idea has just moved beyond “wiki” software per se. As John Maxwell has just pointed out (and this also comes through a bit in the Higher Ed article), perhaps it’s a question of affordances. If the goal is collaboration and editing, it could be that WordPress (and/or other blog tools) is emerging as the tool of choice. (Tony Hirst’s July 9 posting on Open Course Production–linked from your blog) is also interesting from a similar perspective. Good comments from John and Ethel, that I want echo. In our ETEC 522 course at UBC, we’re seeing the need to have both WordPress and MediaWiki operate in a synergistic manner. The course blog is the place where most of the “issues” and “positions” of the course are established in a blog-like fashion of post and comments. Pages are used for baseline course content. The 522 wiki is the place where actual student-led knowledge construction takes place, over time, and with commentary from colleagues that appears in the blog and provides constructive feedback to the construction process. Based on our experiences over the past few years, in the super environment provided for us by Brian and his OLT colleagues, we think the blog-wiki confluence is the best iteration yet for us. Withering wikis is in the same pen as “blogging is dead”- an overreaching simplification that fails to look at an ecosystem too deep and wide to quantify. I quibble a bit with this angle. If you took WikiPedia alone- as a force has been successful beyond most people’s estimates and can hardly said to be withering. But my quibble is the focus that succes is marked by something that is WikiPedia in stature and scale- if you look at the entire ecosystem, go farther down the long tail, my hunch is you will find anything but withering. It’s alive with little bitty wiki fishes. But who has time to look at them all? That is another quibble with such grand sweeping conclusions (c.f. “blogging is dead” and btw nice to see your pulse). As you describe above, it also frames wikis in a limiting sense- things run in wiki software- if you think wider, collaborative editing, e.g. Google Docs, Wave, and I am sure others can chime in other ones. 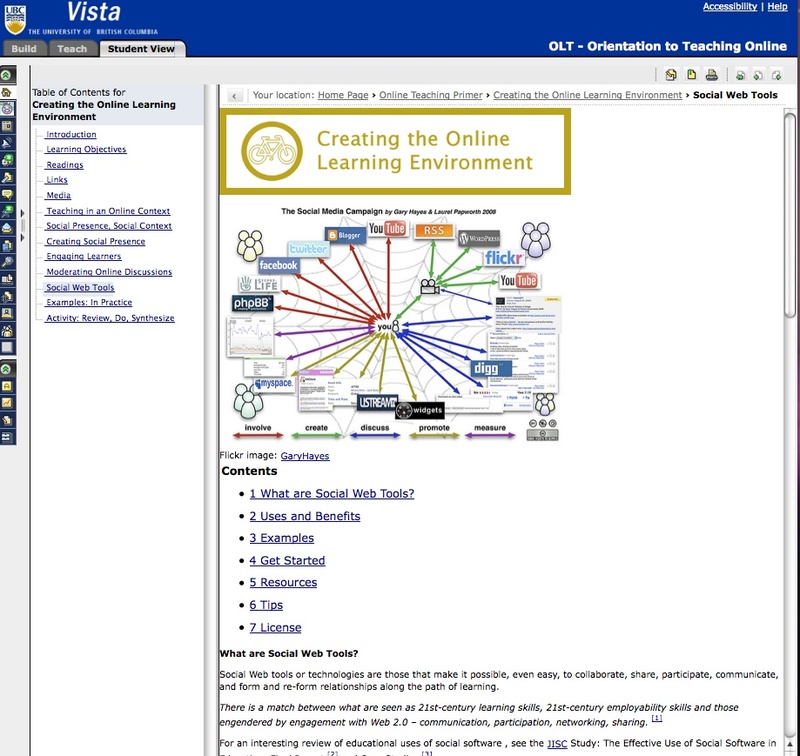 It’s not important to look at wikis as what wiki software does, but what about wiki thinking? I was also a bit disappointed by that tone–that wikis are *dead*, which doesn’t seem right. As a platform for formal scholarship, in the way that scholarship is presently evaluated, there are issues, to be sure, but dead? No. And as a platform for everything else in higher ed (teaching & service, etc. ), wikis are completely at home. New way of thinking content management on institutional scale. If wikis are dead, then they are going to need a few coffins over at Wikispaces and PBworks, both of which claim to have over 300,000 educational wikis on each of their hosted platforms. And what about Wikiversity? I’m not deep in the know so I may be wrong, but it always struck me as a pretty successful, and active, learning community. @John @Ethel @David – You each articulate what I was groping at in my “wikis are mutating” paragraph much better than I could. I think what becomes clear (and David’s course is a great example of this) is that the affordances of these environments are bleeding into each other, becoming more alike even as they integrate more tightly. @Clint – I thought about mentioning the success of platforms like WikiSpaces and PBWorks… and that number does not include the ‘informal’ educators at non-profits or in our communities who use those tools to great effect. 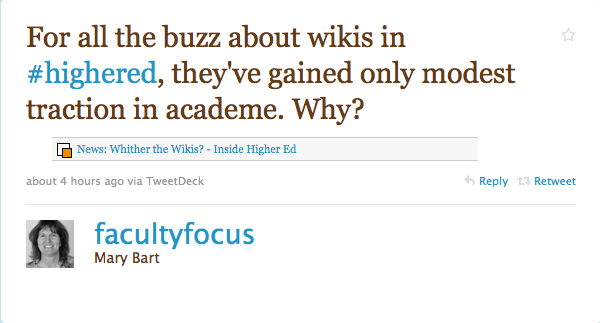 As for Wikiversity, I thought about citing it as well, but am unsure if it is a “success” as well. I know there is some incredible work happening there (I’m a big fan of Teemu’s http://en.wikiversity.org/wiki/User:Teemu)… but have also heard rumblings that the scale of “impact” (whatever that means) has been disappointing to some. There have also been some controversies around governance see this page and Leigh Blackall’s post). The emphasis in the article as well as Brian’s post seems to be on wiki as product versus product. I’ve found wikis to be still the best media for brainstorming and drafting collaborative work. One particular advantage of wikis over similar media (like google docs) is the ability to create new pages, and indeed architectures, very simply. That’s not to say it can’t be done with other media, but I’ve always seen a wiki as an environment, a web if you will, while a google doc is just a page–Very different in my mind.